THE UNIVERSITY of Minnesota's Earl E. Bakken Center for Spirituality & Healing enriches health and wellbeing by providing exemplary interprofessional education, conducting rigorous research, delivering innovative engagement programs, and advancing innovative models of care. It is our vision to advance the health and wellbeing of individuals, organizations, and communities through integrative health and healing. Founded in 1995, the Center is an interdisciplinary unit within the University's Academic Health Center alongside the School of Nursing, the Medical School, College of Veterinary Medicine, the College of Pharmacy, the School of Public Health, and the School of Dentistry. Our faculty – nearly 80 in number – are leaders from diverse academic backgrounds, and are passionate experts in their fields. More than 1,700 students take our courses each academic year, and thousands participate annually in our community programs and workshops. THE CENTER is committed to conducting rigorous science that can inform health policy, programs, and practices. Center faculty are involved in designing original grant-funded research, participating on interdisciplinary research teams within and outside the University, mentoring aspiring scientists, and applying and integrating research into the Center’s academic courses. WE HAVE FORGED strategic, consultative relationships with healthcare systems, Fortune 500 companies, health plans, clinics, governmental bodies, senior living, and other academic institutions and units. We seek to bring scholarship, new skills, and innovative tools to a wide range of organizations, affording leaders new ways to increase health, wellbeing, and engagement of employees and other constituents. Our consulting services, programs and workshops are customizable; we welcome the opportunity to co-create with our clients. The University of Minnesota's Academic Health Center is composed of six schools and colleges that educate health professionals. These include the School of Dentistry, the Medical School, the School of Nursing, the College of Pharmacy, the School of Public Health and the College of Veterinary Medicine. It is also home to rich and vibrant interdisciplinary centers and institutes that focus on specific fields of study including the Masonic Cancer Center, the Institute on Health Informatics, and the Center for Spirituality & Healing. The Academic Health Center is one of the most comprehensive academic health centers in the nation and a leader in interprofessional education—health professionals and students work and learn together. At the Bakken Center for Spirituality & Healing, wellbeing permeates everything we do. Wellbeing is a state of balance or alignment in body, mind and spirit. In this state, we feel content; connected to purpose, people and community; peaaceful and energized; resilient and safe. In short, we are flourishing. 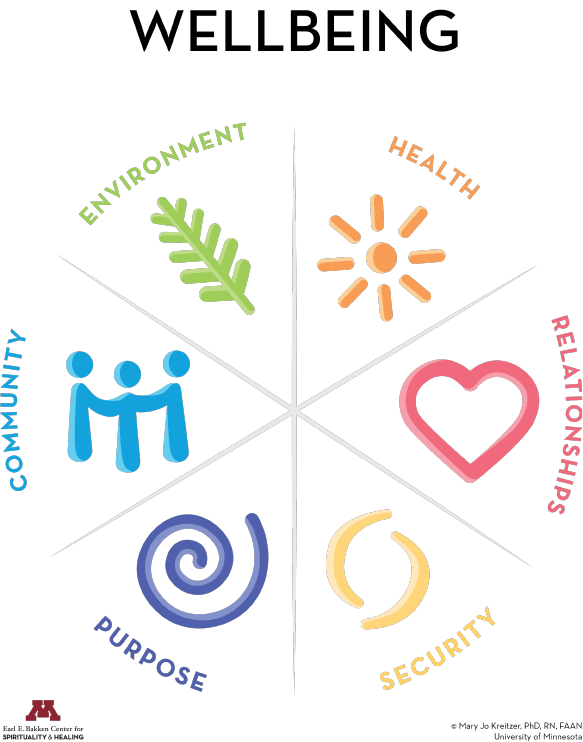 Our personal wellbeing - as well as the wellbeing of our families, the organizations in which we work, and the communities in which we life - is influenced by many factors illustrated in our Wellbeing Model. You may explore our interactive Wellbeing Model on our Taking Charge of Your Health & Wellbeing website. THE CENTER works within communities to extend the reach of our educational offerings and research. We co-create with community centers, grassroots groups, and local leaders to provide rich opportunities to improve community health and wellbeing. Taking Charge of Your Health & Wellbeing, our popular consumer wellbeing website that reaches more than 250,000 unique visitors each month.